Herb and Lois are full-timers we met through ham radio rallies years ago. Debbie and I have fun with them and share many interests including walking. This day Debbie and Lois drove to Quartzsite on a shopping trip. Herb and I agreed we might take a little walk while the girls were away. Herb and I left our campsite intending to stroll about looking for Woody, the Hi-Q antenna guy. Herb has a couple of Hi-Q ham radio antennas (neat stuff!) and brought along some money to buy a few more parts from Woody. I assumed Herb knew where we were to look and I had no idea whatsoever where Woody might be camped. Had we talked a little more about our prospective walk I would have figured we were really just on a walkabout in the desert south of Quartzsite. Which is fine but I would have brought along more stuff than I did. The search and rescue guys had only two days before given a presentation to our large group. These SAR guys provided very clear precautions before striking out into the desert and Herb and I violated all but one. Good news, we did have a portable ham radio and a cell phone with good service and battery. We had no water, no sandwiches, no sunscreen, no camera, and had left no note as to our walk plans. And, if I had remembered it, we had a quite capable compass in my Suunto wrist computer/watch. The compass would have been helpful if I had remembered it AND if we knew what bearing to take. You do need both, a compass isn’t as useful if you don’t know where you want to go. So Herb and I set out along a pretty decent road from our camp, walking briskly. After 45 minutes we see a settlement a mile or two (or three) ahead in the desert and decide we’ll keep going in that direction. We arrived a the housing development (park model development?) after another 45 minutes, or two miles walking, and spent twenty minutes walking 3/4 around it. We were at least two miles from Quartzsite and not sure whether we could find Debbie and Lois there and hitch a ride back with them so we struck off across the desert toward (we thought) our encampment. Bearing on a distant landmark in the mountain range well to the southwest, we headed across the open desert watching for the road we had hiked in. It was a well-traveled road we were sure we “couldn’t miss”. More than two hours later we had missed the road without knowing it. We also didn’t realize we passed well west of our campground and extended our walk a couple of miles. Thinking we needed to change our approach we headed for some buildings to our east, and encountered a dirt-biker heading by us. He told us we had a several miles on a new course to reach our campground and pointed the way. Fortunately the dirt-biker was correct on the direction and overestimated the distance a tiny bit. We entered the Road Runner BLM “campground” from a new (for us) angle. We saw this antenna — it was worth the walk to see this antenna holding the little camper down. Herb and I marched, triumphant at our 10+ mile walkabout, into the campsite. And drank a gallon of water each. 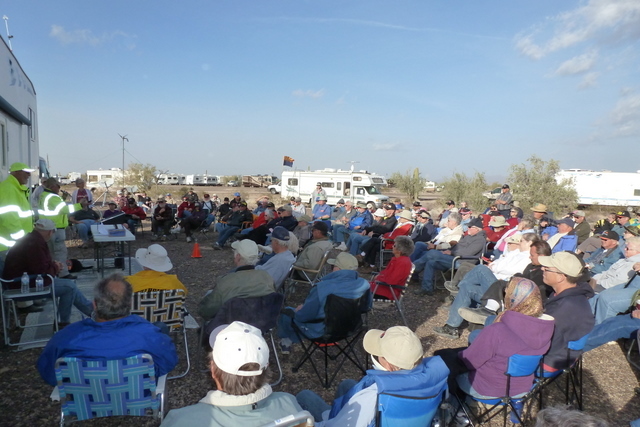 Next up — pictures and descriptions of our week in the desert (no, not walking) with 400 other amateur radio RVs at the 2012 Quartzfest Rally in Quartzsite. 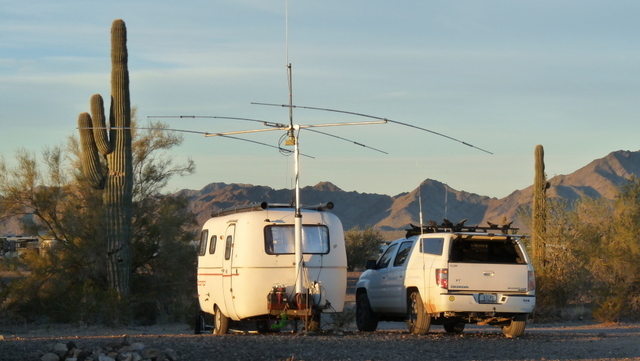 This entry was posted in Full-timing, Safety, Sightseeing and tagged desert walk, ham radio antennas, Quartzfest, Quartzsite, SAR. Bookmark the permalink.